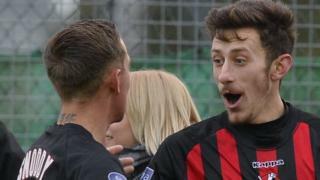 Jordan Forsythe scores twice as Irish Premiership leaders Crusaders win 3-1 away to bottom club Warrenpoint Town. Forsythe bagged his double after Paul Heatley had given the Crues an early lead from the penalty spot. Daniel Hughes pulled a goal back but it could not prevent Warrenpoint from falling to an 11th league defeat in a row.